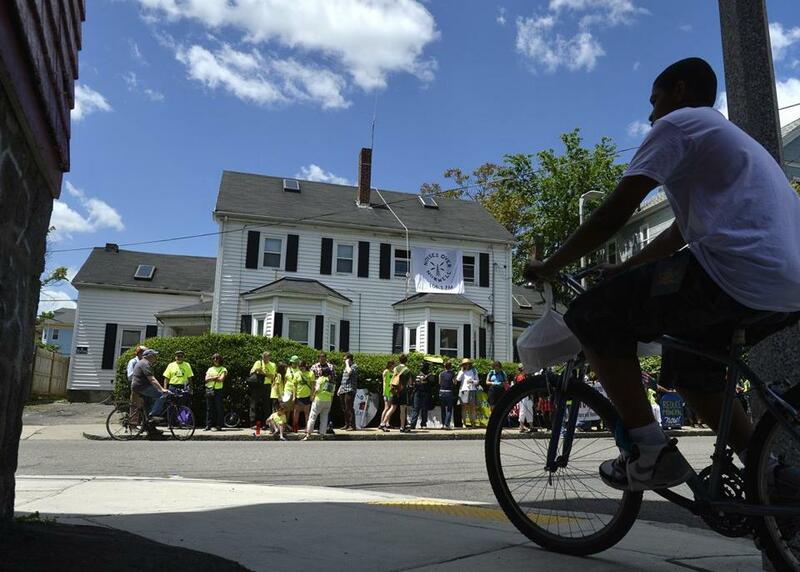 Activists rallied on Saturday in Dorchester at a home that they took over to make a statement: Housing is a human right. The 58-year-old Hyde Park resident told her story to a crowd of more than 60 at a rally for affordable housing in Dorchester on Saturday. The day’s main event was the occupation of a vacant home owned by Fannie Mae, a symbolic step toward reclaiming a neighborhood plagued by rising housing costs that have led to foreclosures and evictions. A community organizer for City Life/Vida Urbana, which is part of a coalition that held the rally, Blanco said the event was about creating a home for a family who lost their Roxbury house after a foreclosure. Paul and Renée Adamson, the couple moving into the house, said they would risk eviction in order to make a statement: Housing is a human right. They found themselves homeless a couple of years ago after being displaced from their longtime Roxbury home by City Realty Group. They’ve moved around since, staying with relatives or trying to rent. Now, finally, they will have a place to stay, said Paul Adamson, 61. “If I’m given a rental figure, me and my wife would be more than happy to pay it,” he said. Foreclosures and predatory loans have hit neighborhoods such as those in Dorchester hard, Blanco said, spurring a renters’ crisis with a shortage of affordable housing. The occupied house on Norwell Street became vacant in February when its previous owner was forced out, she said, and Fannie Mae has rejected offers by a local nonprofit developer to buy it. Fannie Mae did not immediately respond to a request for comment. The citywide median rent for apartments in one-, two- and three-bedroom homes was $2,250 in 2012, according to city data. In 2002, the median price for a two-bedroom apartment was $1,550. The median price of a home has increased during the same period to $383,000 in 2012 from $315,000 in 2002. Laura Foner, a board member of City Life, said she has seen rent reach unaffordable levels in her Jamaica Plain neighborhood. Foreclosure rates have fallen sharply since lenders seized more than 1,200 Boston properties in 2008; last year, lenders completed fewer than 100 foreclosures. But Blanco said people are still fighting to remain in or reclaim their homes, something the Adamsons’ occupancy represents. The rally also celebrated the launch of Noises Over Norwell, a radio station based on the property that broadcasted the day’s events. Organizers said they will dedicate air time to the “noises” of everyday living, such as the ambient sounds of watching TV and making dinner, to spark conversation about what makes a home. Geraldine Louis, a longtime Dorchester resident, listened to the rally from her porch near the occupied house. She supported the protesters, who she said were providing a service by highlighting mortgage companies’ unfair practices. His wife sat smiling as she listened to speakers testify. Claire McNeill can be reached at claire.mcneill@globe.com. Follow her on Twitter @clairemcneill.